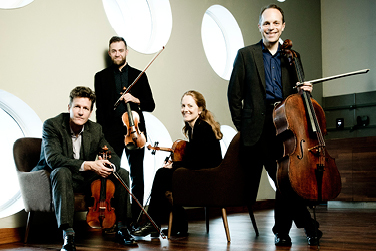 The St. Lawrence String Quartet (SLSQ) is renowned for the intensity of its performances, its breadth of repertoire, and its commitment to concert experiences that are at once intellectually exciting and emotionally alive. This ensemble brings every piece of music to the audience in vivid color, with pronounced communication, imaginative and spontaneous music making, and an energetic commitment to the composer, whether established or new. Established in Toronto in 1989, the SLSQ quickly earned acclaim at top international chamber music competitions and was soon playing hundreds of concerts per year worldwide. They established an ongoing residency at Spoleto Festival USA, made prize-winning recordings for EMI of music bySchumann, Tchaikovsky and Golijov, earning two Grammy nominations. This season, as they have done in the past, SLSQ returns for a multi-day residency, performing and coaching young composers and musicians in the School of Music. This performance is sponsored by Richard and Sarah Bourne. Attend St. Lawrence String Quartet: Composer Reading Wednesday, February 28, 2018 at 7 PM.